Wireless technology more than 10 times faster than the best Wi-Fi is coming to market in 2015. Adding this circuit board to a laptop allows it to use a new wireless technology called WiGig that is more than 10 times faster than a typical Wi-Fi connection. Smartphones, tablets and PCs should appear this year that can send and receive data wirelessly more than 10 times faster than a Wi-Fi connection. As well as transferring videos and other large files in a flash, this could do away with the cables used to hook PCs up to displays or projectors. The wireless technology that will allow this is known as 60 gigahertz—after the radio frequency it uses—and by the name “WiGig.” Computing giants including Apple, Microsoft, and Sony have quietly collaborated on the new standard for years, and a handful of products featuring WiGig are already available. But the technology will get a big push this year, with several companies bringing products featuring WiGig to market. WiGig carries data much faster than Wi-Fi because its higher frequency radio signal can be used to encode more information. The maximum speed of a wireless channel using the current 60 gigahertz protocol is seven gigabits per second (in perfect conditions). That compares to the 433 megabits per second possible via a single channel made using the most advanced Wi-Fi protocol in use today, which transmits at five megahertz. Most Wi-Fi networks use less advanced technology that operates even slower. 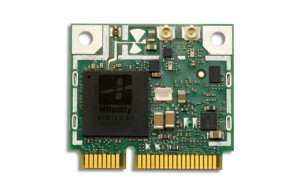 Qualcomm, a leading maker of mobile device processors and wireless chips, has invested heavily in WiGig. At the International Consumer Electronics Show in Las Vegas this month, the company demonstrated a wireless router for home or office use with the technology built in. That device will go on sale by the end of 2015. Qualcomm has also designed the latest in its line of Snapdragon mobile processors to support WiGig. The “reference designs” Qualcomm shows to customers include its 60-gigahertz wireless chips, and the first devices built using the Snapdragon 810 processor are expected to go on sale in mid-2015. At CES, Qualcomm showed tablets built with that processor using WiGig to transfer video. Mark Grodzinsky, a director of product management at Qualcomm, says WiGig technology should be much more reliable than Wi-Fi. As well as reducing congestion by providing a fresh chunk of airwaves to use, WiGig suffers less interference because it is directional. Whereas Wi-Fi devices blast their signal in all directions, WiGig ones use an array of tens of tiny antennas to point a beam toward the device they are connecting to. Those working on WiGig technology predict that demand for high definition video will make the technology necessary. The latest smartphones now record video at extremely high resolution. Grodzinsky says WiGig will start appearing in set-top boxes, making it easier to stream content from mobile devices to high definition TVs, or upload it to the Internet. Qualcomm calculates that its WiGig technology will make it possible to transfer a full-length HD movie in just three minutes. Posted in Uncategorized and tagged speedy wireless, Wi-fi, wifi, WiGig, wireless technology. Lightning fast shipping + great memory + great price = Excellent Ebay Seller! Great product and it shipped out very fast! !